VIEW OUR GEMSTONE CATEGORY FOR OUR CURRENT SELECTION. Hearts have always been a symbol of love. 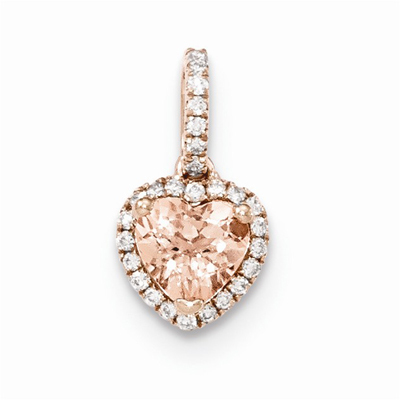 Show your love with our heart shaped morganite and diamond pendant. The center light pink morganite measures 6.5mm and is surrounded by 26 white diamonds that have total carat weight of 0.14 tcw. The entire pendant is set in 14k rose gold. We guarantee our Morganite & Diamond Halo Heart Pendant, 14K Rose Gold to be high quality, authentic jewelry, as described above.